MASTER PROBLEMS People and Society Hospitality in Africa-Why under stress? Hospitality in Africa-Why under stress? When you approach a door in Eastern Africa, calling out the customary Swahili word Hodi!, which may be translated “May I come in?” From inside you will hear the answer Karibu, meaning “Come in! Then someone with a friendly smile will come from inside the house. In a matter of seconds your belongings have been taken into the house. Only after stepping into the sitting room and you are seated, will the host receive information on the purpose of your visit." This is just one of the many varied expressions of hospitality in Africa, which deeply impress visitors from overseas. Kindness to strangers is considered a great virtue on this continent. Many Africans do not limit hospitality just to relatives, friends or invited guests. They extend a lot of courtesy to strangers as well. The greeting is not hurried or merely formal. Rather, the host takes time to manifest sincerity and interest. The stranger is also viewed as a bringer of news. Many questions are asked about the places and people that he left, as well as those he passed en route. Though the host may have little, the best food is offered to the visitor. Lodging, if needed, is provided willingly. Even if the host has only one mattress or one blanket, in most cases he will put these at the disposal of the visitor. The householder and his children will pass the night without these comforts. Being a guest in a village also means safety, because the host will protect his visitor and his belongings. Upon leaving, a good visitor sometimes receives a parting gift, such as a live chicken. Additionally, the host counts it a privilege to accompany the traveler part way to his destination. From childhood most Africans are taught the virtue of hospitality. Even small children are called to greet the visitor and do small services for him. 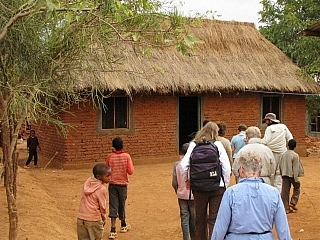 Some tribes construct their villages so that young men of the community live in a separate house in the center of the village, where they can offer hospitality to strangers passing through. Other tribes have older men on duty to welcome strangers at such a center. A stranger trying to go by a village on the outside would be viewed with suspicion; he is expected to pass through the village and make his presence known. In some areas he must meet the village chief or his representative. In many tribal societies a visitor will not only be served with food, drink, bedding and water for washing, but, as a matter of course, will be permitted to use most of the things his host has at his disposal. That is why in Africa you can see people go on a journey of hundreds of kilometers, for days or weeks, with almost no luggage. The traveler counts on hospitality being extended to him along the way. Under the hot sun and on narrow footpaths it is advantageous not to have a heavy load. And then there are sometimes rivers through which to wade or swim. Hospitality makes it much easier to cope with these discomforts. In the eyes of most African people, many customs of the Occidental world seem callous, abrupt and discourteous. They cannot imagine someone’s eating food in the presence of visitors, asking them to wait, as Westerners sometimes do. Giving something casually or hurriedly, or using the left hand to return small change, makes a person look bad in the eyes of Africans. Popping into a house and bringing up a matter while standing, refusing to sit down first, is not appreciated either, unless there is a good reason. When a visitor declines to accept a seat or food offered to him, it may be counted as akin to an insult. On the other hand, Africans highly appreciate the efforts of overseas visitors to show respect for these customs related to hospitality. But it seems now it is under stress. Why? Why Hospitality Is Under Stress? Hospitality in Africa, however, is undergoing rapid change. Human selfishness, the love of money, criminal elements and city life with its rush for time have dampened the hospitality of a good number. Many sincere hosts have had bitter experiences, as not all visitors came in peace. Past centuries brought slave traders, greedy adventurers and tribal enemies. In recent times strangers have often proved to be criminals. When industry arrived in Africa, city life created new desires; and, for many, competition replaced cooperation, giving rise to feelings of distrust for strangers. One problem was the question of how to adapt traditional hospitality to city life and an economy based on money. In cities, housing space is usually quite limited, resulting in higher rents and crowded conditions. Salaries are low; yet food generally cannot be grown, but must be bought. At the same time, persons left in villages hear of city life and its attractions. They feel a growing urge to visit the city to see it for themselves, or even start living there. Where do such individuals go when they arrive? Without question, their relatives or even distant acquaintances in the same tribal area must show hospitality. This easily leads to abuses. Most Africans never ask a relative how long he intends to stay. Hence, some stay indefinitely. At first, the host willingly shares his food, while his wife washes the visitor’s clothes. The relative or acquaintance finds it quite normal to let himself be “spoiled” without sharing in the work. Since he feels truly at home, he may begin even wearing the host’s clothes. Then one day a taxi may pull up in front of the house, and another young man may step out. He, too, has come from a village to stay in town. Since he entered the taxi without a cent in his pocket, he asks the host to pay the taxi fare. Possibly the host does not even know him personally. But due to his being from the same village or because of his being known through a distant acquaintance, hospitality moves him to pay, sometimes with a sigh. When the host looks at his wife and children who tell him that they are hungry and need clothing, he may sigh some more! Some workingmen in cities are housing up to 10 and more relatives or distant neighbors who come for schooling or to find employment. Living in the center of town, especially near a main bus stop, can cause further problems. Some have found it necessary to solve the problem of dwindling finances by quietly moving and not telling others where they are going. Even in villages a changing mood is evident. Passing strangers often have proved to be thieves. Some villagers admit that when a stranger approaches they hide their food or offer things for sale only. At times, in the equatorial forest, persons traveling in vehicles have found the road blocked by a heavy tree. On getting out and looking at the obstacle, the drivers note a group of villagers nearby, ready to discuss the price for clearing the tree off the road. After the vehicle passed, however, the tree is moved back across the road so that the villagers can make the same profit from others who might wish to pass by. So, in a good number of remote areas strangers cannot count on traditional hospitality anymore. They must be prepared to pay, and sometimes to pay large amounts. As is the case with many other human qualities, hospitality is losing ground in much of the world, including Africa. Has this general spirit of selfishness and distrust killed hospitality in Africa? While for some that may be the case, it is by no means true all persons living on this continent. In a changing Africa there are still many, especially older ones, who attach great importance to hospitality.